Rema Tip Top Innerliner Repair Sealant non flammable BOWES RTC 76. REMA TIP TOP offers two distinct Repair Sealer formulations to accommodate unique customer preferences or requirements. 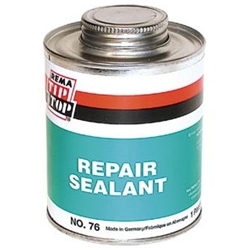 • Properly applied, Repair Sealer creates an airtight seal around a finished repair, over buffed areas or porous tire innerliners. • Prudent use of Repair Sealer maintains the integrity of the repair.